Between 1963 and 1964 Jaguar built 12 Lightweight E-Type Jaguars with six cylinder engine blocks, monocoques and bodies all made from aluminium which saved 250 lbs / 114 kgs over the standard E-Type. 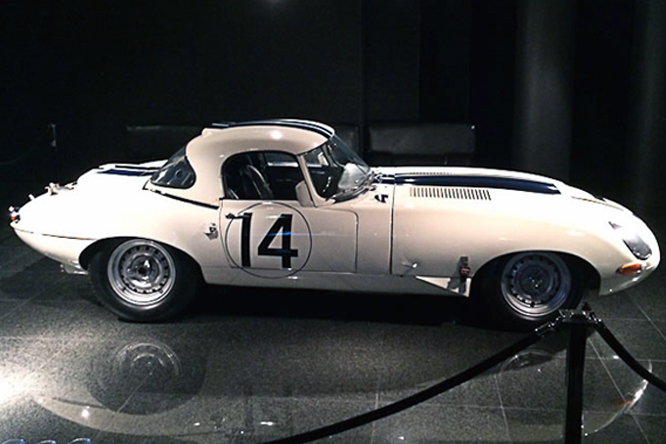 Today’s featured Ligthweight E-Type, chassis #S850659, is the seventh of the 12 to be built and was delivered to Briggs Cummingham in time for him to enter it into the Sebring 12 hours for Bruce McLaren and Walt Hansgen to drive. Bruce and Walt finished the race in 8th place one place and one lap down on the class winning Kjell Qvalle lightweight E-Type #S850660 driven by Ed Leslie and Frank Morrill. The cars next appearance was at Le Mans in 1963, where Walt Augie Pabst replaced Bruce McLaren to share driving the #14 with Walt. By this time Briggs has acquired two more lightweight E-Types to make up an impressive 3 car team. After just 8 laps Walt retired the #14 with a broken four speed gearbox, the sister #16 manged just 40 laps before Paul Richards and Roy Salvadori retired with fire damage after an accident. Team Patron Briggs and Bob Grossman also had to pit after loosing it’s bonnet in an accident, but rejoined the race to finish 9th overall and second in class to the AC Cobra driven by Peter Bolton and Ninan Sanderson. 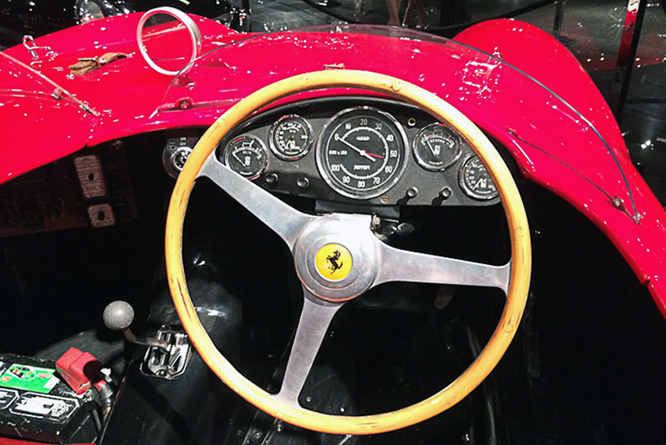 After Le Mans #S850659 was fitted with a 5 speed ZF gearbox by the factory and driven to a third place finish by Walt Hangsen in the 1963 Bridgehampton 500 kms. 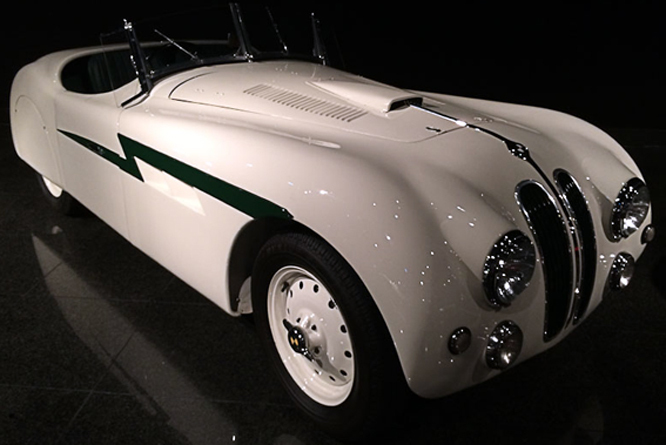 The car seen in these photographs, by Geoffrey Horton at the Blackhawk Museum, last year was tested by Simon Taylor in 1996 when he described it as a “pussycat” to drive, a racing car one “could go shopping in”. Thanks for joining me on this “Weight Saving Pussycat” edition of “Gettin’ a li’l psycho on tyres” I hope you will join me again for “Ferrari Friday” tomorrow. Don’t forget to come back now ! This entry was posted in Uncategorized and tagged Aluminium, Blackhawk Museum, Colmar, Cunningham, E-Type, GALPOT, Geoffrey Horton, Hangsen, Jaguar, Lightweight, McLaren, Pabst, Ralph, Tayor on June 19, 2014 by Ralph. 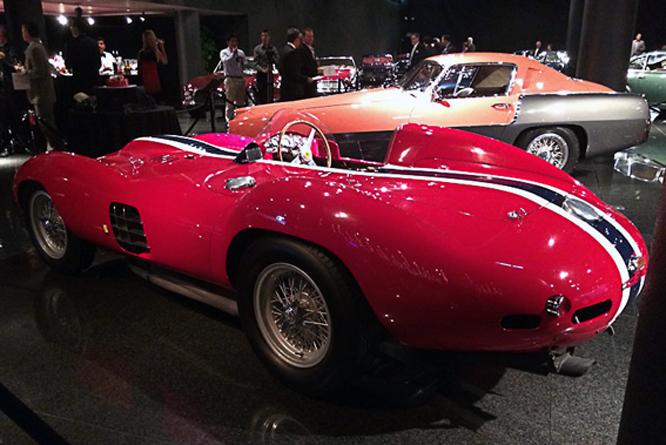 Seriously regular GALPOT may remember a Ferrari Friday in March 2011 in which I posted a photograph taken in 1956 by Road & Track photographer Carlisle Blackwell featuring a Ferrari 750 Monza on the 20th Century Fox back lot. Geoffrey Horton caught up with the car chassis #0538 at the Blackhawk last year and while I have no new information about the car I thought you might enjoy looking at the one off low nose body which original owner Mr Paravano is rumoured to have paid Scaglietti well over the odds for. Soon after #0538M was purchased by William Shaker for $600,000 with a Chevrolet V8 installed the car is said have gone on an unmanned trip down Mr Shakers drive and come to rest against his Volvo, ironically Volvo is Latin for “I roll”. I have not been able to establish which, if indeed any, of the Ferrari’s panels were damaged in the incident. Another mystery as yet unresolved is who was seen at the wheel of #0538M when Carlisle Blackwell took the photo’s of it for the cover of Road & Track in December 1956 ? If you recognise him please do not hesitate to chime in below. My thanks to Geoffrey Horton for sharing his photographs from the Blackhawk Museum and Pamela Blackwell for permission to use her fathers photograph. Thanks for joining me on this “Volvo Survivor” edition of “Gettin’ a li’l psycho on tyres”, I hope you will join me again for a look at a nice self build. Don’t forget to come back now ! 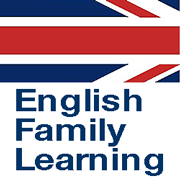 You do not need to be resident in Brighton, or even the UK to sign. 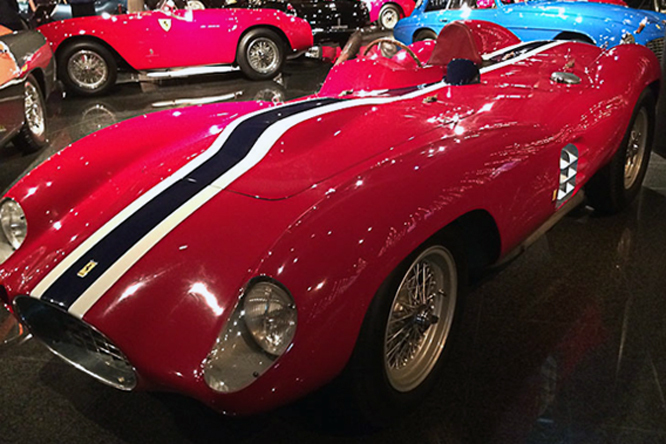 This entry was posted in Uncategorized and tagged 750, Blackhawk Museum, Blackwell, Brighton Speed Trials, Ferrari, GALPOT, Geoffrey Horton, Monza, Paravano, Ralph Colmar, Road & Track, Scaglietti, Shaker, Sports Racing Car, Volvo on January 17, 2014 by Ralph. 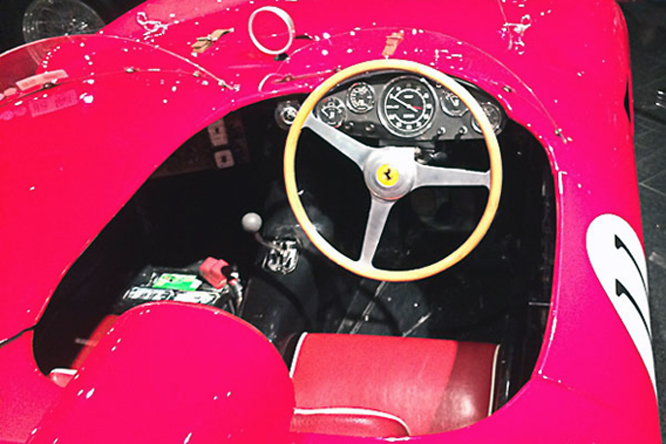 After weeks of being adrift thanks to a few server issues it feels great to be finally back up to speed with to speed with today’s Ferrari Friday blog. My thanks to everyone for their patience and understanding during this challenging time for GALPOT. 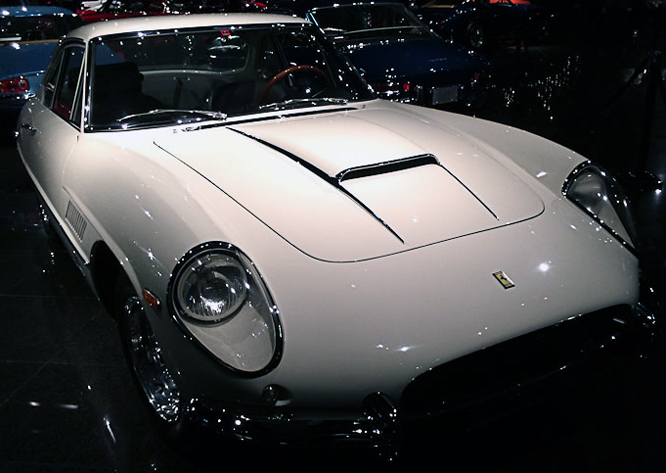 The Ferrari 400 Superamerica was launched in 1959 with a 340hp 4 litre / 244 cui Columbo V12 which replaced the Lampredi V12 that had been the mainstay of the America series Ferrari’s going all the way back to 1950. Chassis #3221SA the 18th of 25 such cars built was delivered to a French customer in 1962 and for a while belonged to the Marquis de St. Didier and later, in the 1980’s, to the President of Cartier Alain Dominique Perin. 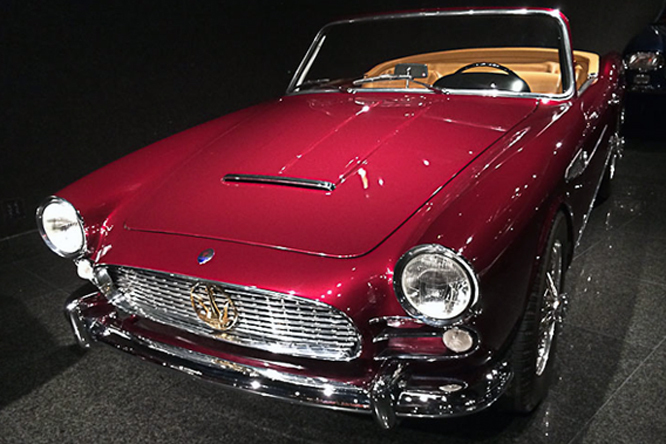 Pininfarina offered Coupé, Cabriolet and Spider bodies for the 400 Superamerica Series 1 which was produced until 1962 when it was replaced by Series 2 of which 22 were built up until 1964. My thanks to Geoffrey Horton for sharing his photographs taken at the Blackhawk Museum. 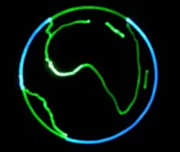 Thanks for joining me on this “Aerodynamic Jewel” edition of “Gettin’ a li’l psycho on tyres”, I hope you will join me again tomorrow when I’ll be looking at a Formula 5000 car that unexpectedly beat a top drawer Formula One field. Don’t forget to come back now ! 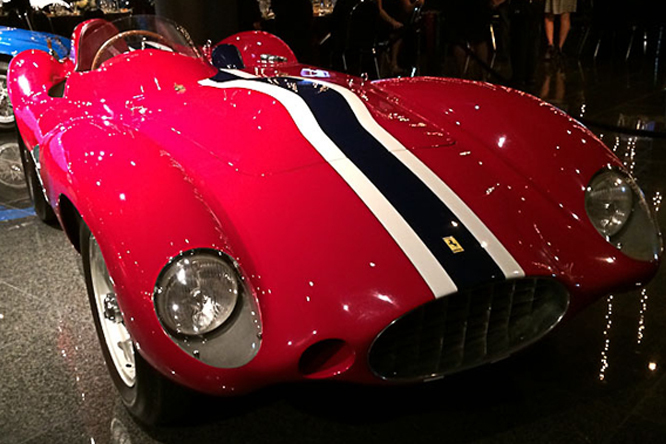 This entry was posted in Uncategorized and tagged 400, Alain Dominique Perin, Blackhawk Museum, Cartier, Colmar, Colombo, Ferrari, GALPOT, Geoffrey Horton, Marquis de St. Didier, Ralph, Sports Car, Superamerica on December 20, 2013 by Ralph. 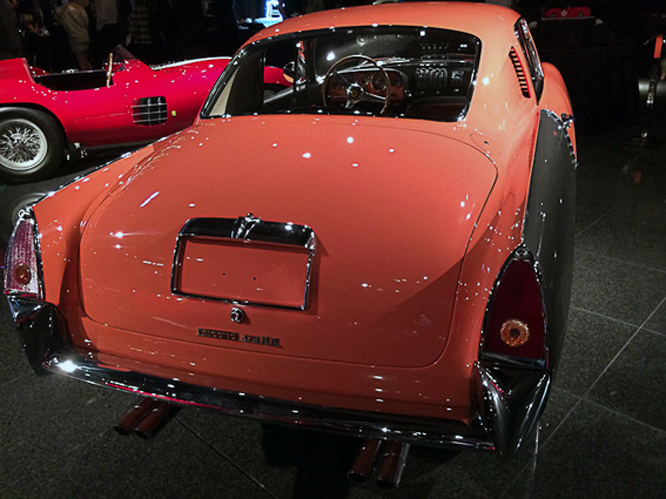 In 1955 Ghia built the body work for a new Ferrari for the last time, and one might well wonder if this had anything to do with the salmon over metallic grey paint job. Today’s featured Ferrari 375 MM Ghia Coupé chassis #0476AM, photographed by Greoffrey Horton at the Blackhawk Museum earlier this year, is not only the last Ghia bodied Ferrari it is also the only Ghia bodied 375 MM chassis making it unique among the 23 street and racing versions of 375 MM. 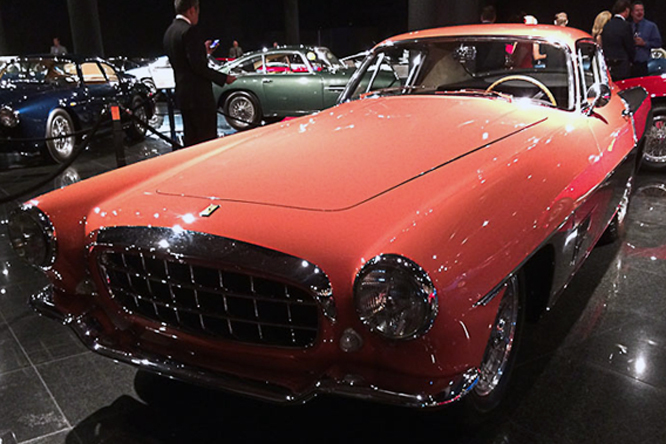 This particular car was shown at the 1955 Turin Motor and New York Auto shows before it found a home with a family in Milwaukee, WI. By 1970 #0476AM had recorded just 12,000 miles, four years later it was sold to a Milwaukee doctor who kept the car for 10 years. In 1984 #0426AM appeared in the Blackhawk Museum for a couple of years before going on a sojourn to Switzerland which lasted at least until December 2002 when the car failed to sell at auction. I am not entirely sure when #0426AM returned to the Blackhawk Museum, if you happen to know please do not hesitate to chip in below. 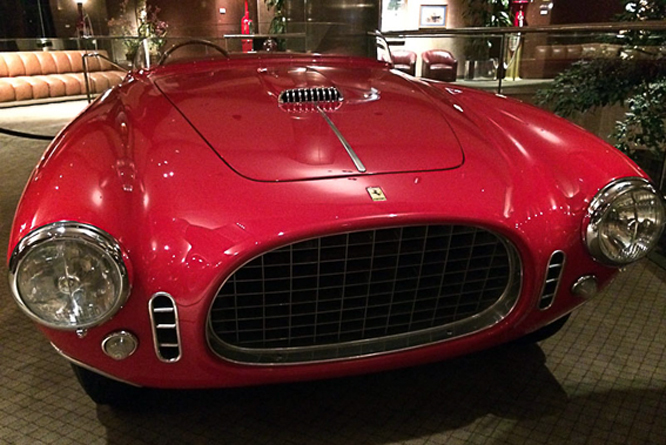 My thanks to Geoffrey Horton once again for saving Ferrari Friday. Thanks for joining me on this “Salmon Over Metallic Grey” edition of “Gettin’ a li’l psycho on tyres”, I hope you will join me again tomorrow when I’ll be looking at an open wheel Formula 5000 car. Don’t forget to come back now ! 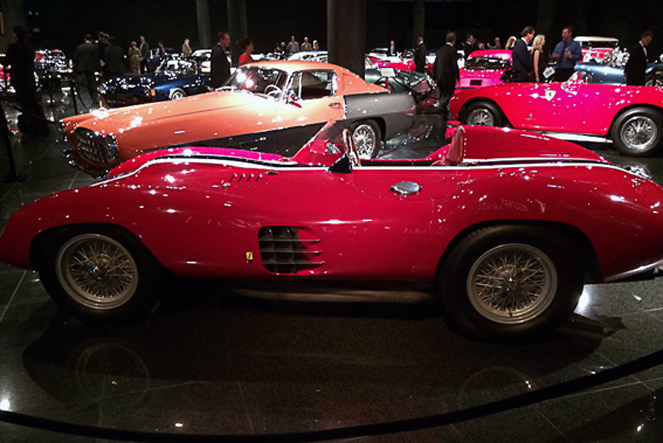 This entry was posted in Uncategorized and tagged 375 MM, Blackhawk Museum, Car, Colmar, Ferrari, GALPOT, Grey, Metallic, Milwaukee, New York, Ralph, Salmon, Show, Sports, Street, Switzerland, Turin on December 13, 2013 by Ralph. 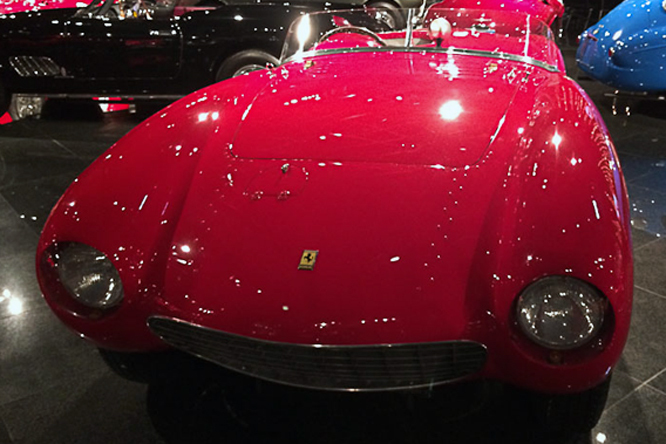 Today’s Ferrari Friday’s looks at a few of the Ferrari Racing Treasures at the Blackhawk Museum captured by Geoffrey Horton. 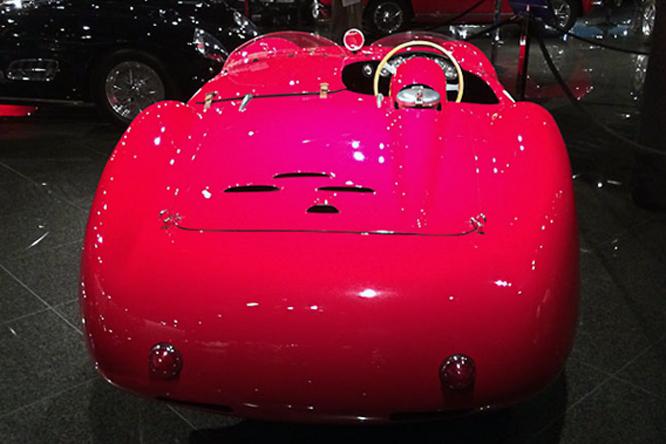 This 1952 Ferrari 212 Export Barchetta features bodywork by Touring of Turin and was originally owned in 1952 by Baron Luigi Bordonaro di Chiaramonte of Palermo and as I posted last year the Baron raced the car successfully. 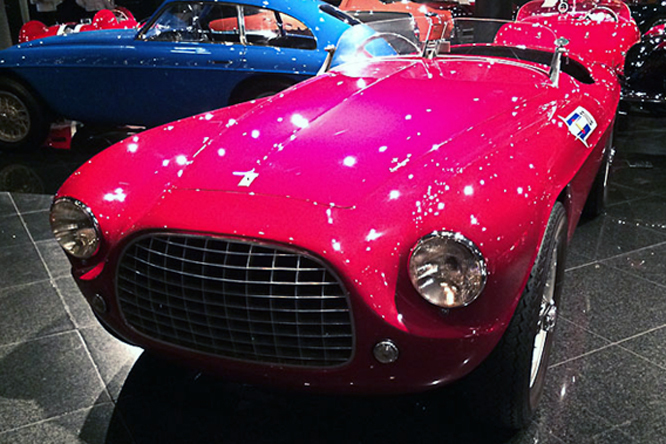 Phil Hill’s 1953 Ferrari 250 MM Vignale #0260MM was featured on this blog a couple of years ago, it helped set up Phil’s career on the path to becoming a three time Le Mans winner and 1960 World Driver Champion all victories which were won driving Ferrari cars. As I have found on many occasions in the past some Ferrari’s are a little more difficult to identify than others this particular 500 Mondial is one of those more difficult to identify as I found out last year. 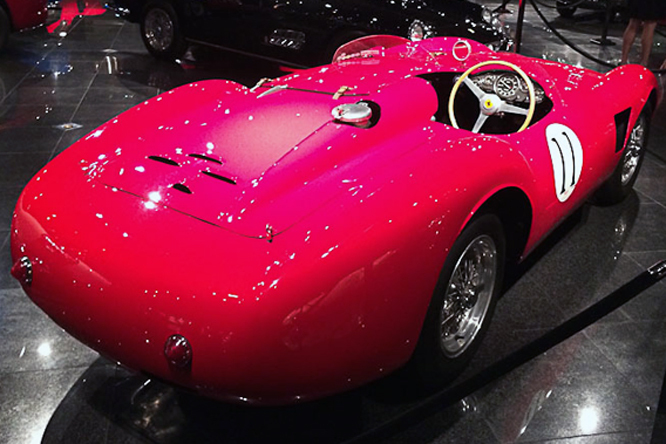 The Blackhawk Collections 1955 Ferrari 750 Monza with unique bodywork by Scaglietti has also featured on these pages before although it will be better remembered for appearing on the cover of Road & Track in December 1956 by many more. It is the car belonging to Tony Paravano that Carlyle Blackwell took a photo of. 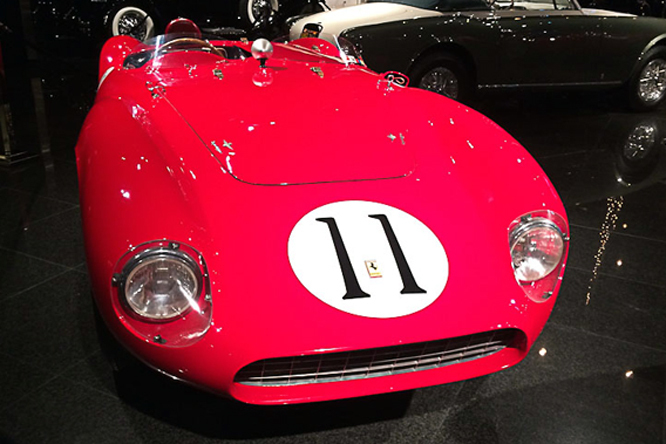 In 1956 Ferrari built 3 625LM’s with Touring bodies and 2,5 litre 4 cylinder motor’s, the one seen here carries the #11 which suggests this is the car that crashed at the start of the 1956 Le Mans 24 hours after it had won the Supercortemaggiore at Monza, fitted with a 2 litre engine with Mike Hawthorn and Peter Collins at the wheel. My thanks to Geoffrey Horton for sharing his photographs, more on these cars will appear in the coming months. 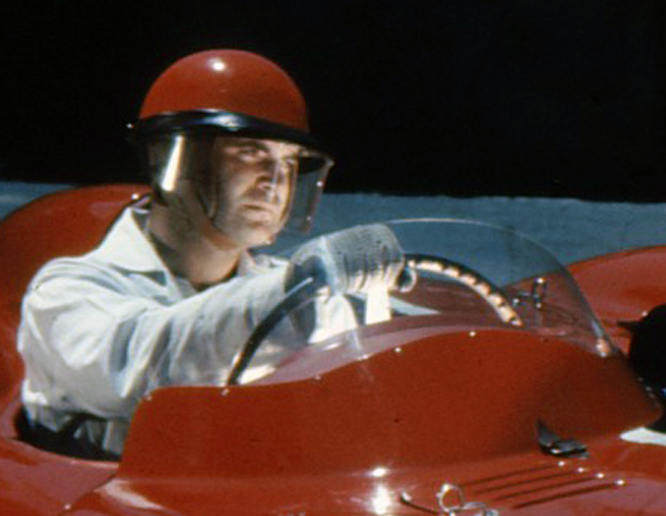 Thanks for joining me on this “Ferrari Racing Treasures” edition of “Gettin’ a li’l psycho on tyres” I hope you will join me again tomorrow. Don’t forget to come back now ! 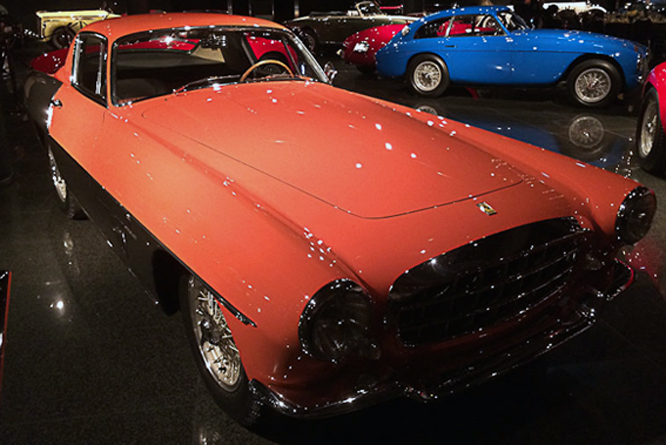 This entry was posted in Uncategorized and tagged 212 Export, 250 MM, 500 Mondial, 625LM, 750 Monza, Blackhawk Museum, Cars, Colmar, Ferrari, GALPOT, Geoffrey Horton, Racing, Ralph, Scaglietti, Sports, Touring, Vignale on October 25, 2013 by Ralph. 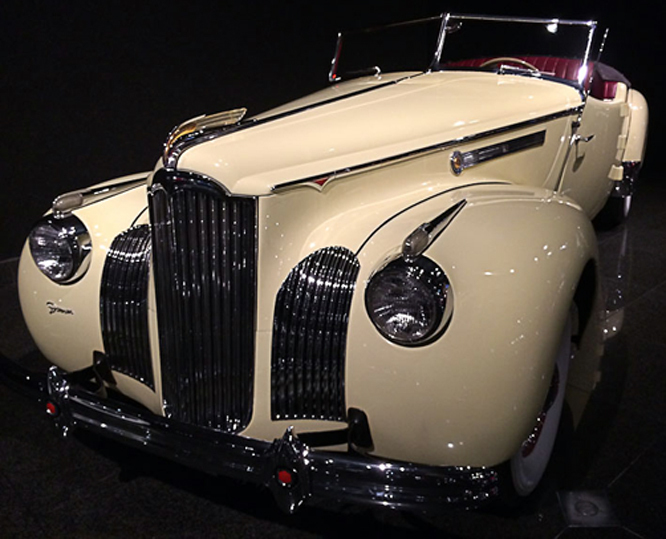 While showing his Jaguar at the Danville Concours d’Elegance last month Geoffrey took a wonder around the automotive treasures at the Blackhawk Museum and kindly sent today’s photographs. 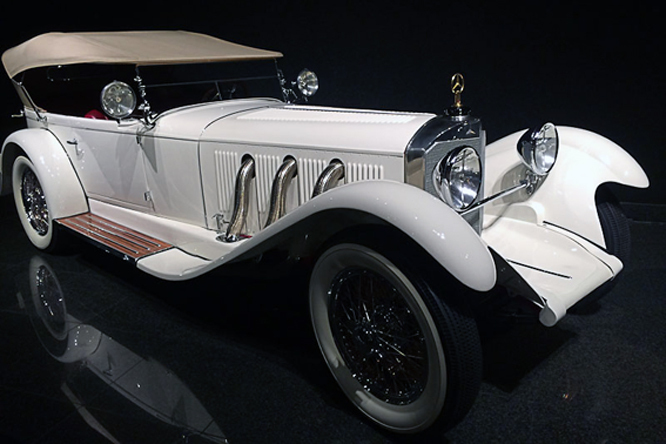 In 1927 Mercedes Benz replaced it’s Model K with the Model S which among it’s innovations introduced a chassis that was lowered between the front and rear axles, which dramatically lowered the cars wind resistance and lowered it’s center of gravity which improved the handling. 146 Model S vehicles were built, this 1928 example was bought new by the entertainer Al Jolson. Minerva was a Belgian manufacturer started by Dutchman Sylvain de Jong, like many motor manufacturers de Jong started building bicycles and by 1928 when he died had graduated to manufacture high end automobiles. 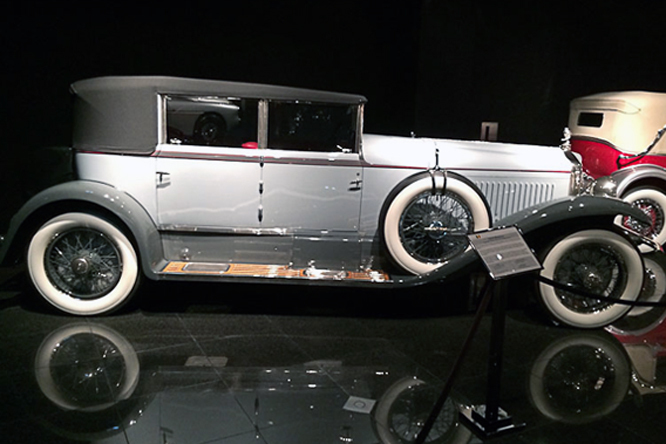 The 1929 Minerva Type AM seen above was supplied as a chassis to which coach builbers Walter M Murphy of Pasadena, CA fitted a “Clear Vision” Convertible Sedan body. The six cylinder car would have been a little cheaper than a contemporary Rolls Royce. After a career working for European coach builders Howard “Dutch” Darrin set up a showroom and bodyshop in Hollywood California called Darrins of Paris to restyle automobiles for Hollywoods rich and famous. Among the cars he restyled was Preston Fosters 1939 Packard 120 seen above with Darrin Convertible Victoria bodywork. 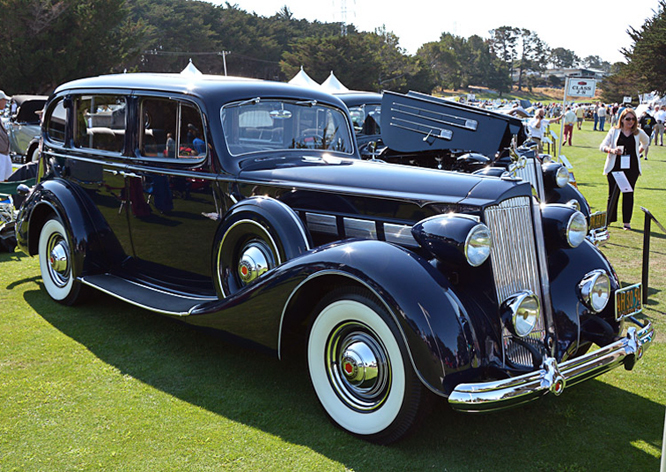 This car was later updated with 1941 Packard Super Eight grill, bumpers and headlights. Fraser Nash were the British importers of BMW cars into Britain prior to the 1939-45 war. Of the 464 BMW 328’s the 1939 example seen above is one of six known to survived the war, it was fitted with a custom Sports 2 seater body by Fraser Nash and driven by Dickie Stoop and Peter Wilson in the 1949 24 hour race at Spa in Belgium where it came home 12th overall sixth in class. 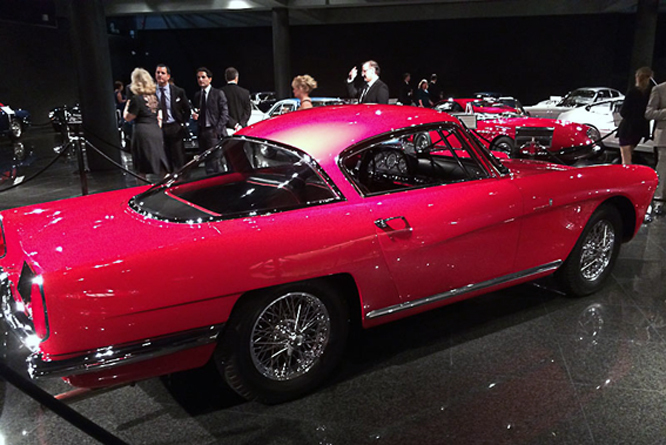 The body of the red gem above is by Bertone of Italy while the chassis and engine is 1954 Aston Martin DB2/4. 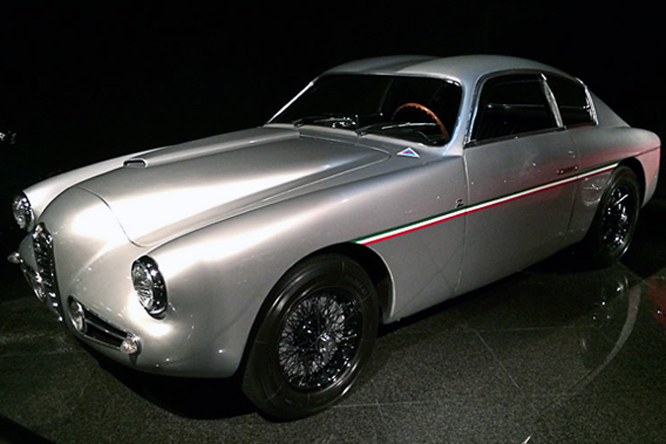 The Aston Martin DB2/4 Bertone Coupé is a one off prototype, no more were built because Aston Martin refused to supply any more DB2/4 chassis though it is by no means the only DB2/4 to feature unique Italian bodywork. When ALFA Romeo wanted a 4 cylinder 2 litre 122 cui motor in 1950 they redesigned their twin cam 6 cylinder 6C 2500 with two fewer cylinders and called it the 1900. The 1955 1900 Sprint Speciale SSZ seen above is one of around 40 thought to have been built with coachwork by Zagato featuring a double bubble roof. 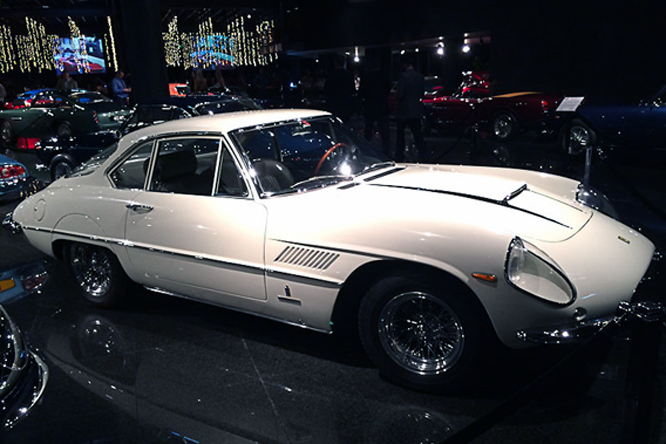 The 140 mph 1960 Maserati 3500 GT Vignale Spider, above, is one of 243 built between 1957 and 1963. 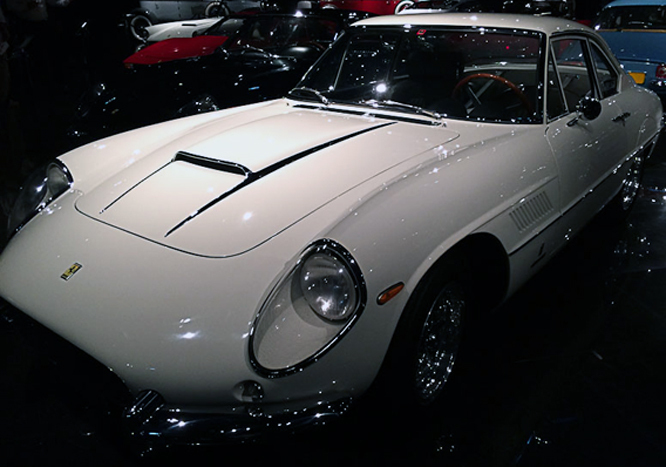 Fitted with drum brakes and a four speed gearbox it was more luxuriously appointed than the Ferrari 250 GT’s against which it competed in the market. 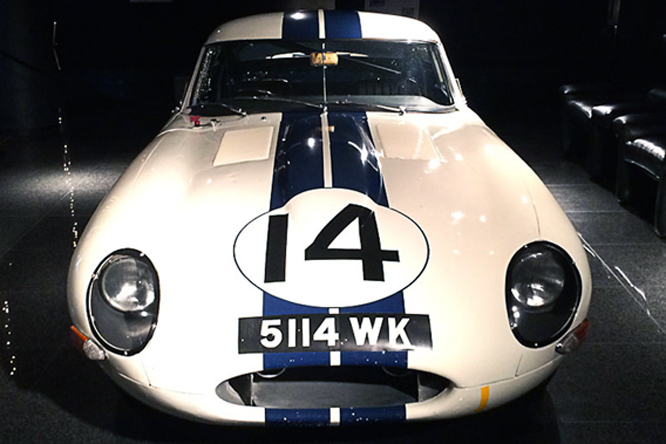 In 1963 Briggs Cunningham entered 3 factory built Jaguar XK-E’s with hard top alloy bodies in the Le Mans 24 hours. One, 5115 WK qualified 20th and finished 9th, 5116 WK qualified 18th and was destroyed by fire after an accident on lap 40 while the car above driven by Augie Pabst and Walt Hangsen qualified 13th and retired in lap 8 with a broken gearbox. My thanks to Geoffrey Horton for sharing today’s photographs, more of which from the Blackhawk Museum will be seen on Friday. Thanks for joining me on this “Automotive Treasure” edition of “Gettin’ a li’l psycho on tyres” I hope you will join me again tomorrow for Americana Thursday when I’ll be looking at a Ford Thunderbird. Don’t forget to come back now ! This entry was posted in Uncategorized and tagged ALFA Romeo, Aston Martin, Bertone, Blackhawk Museum, BMW, Colmar, Cunningham, Darrin, de Jong, Foster, Fraser Nash, GALPOT, Geoffrey Horton, Hangsen, Jaguar, Jolson, maserati, Mercedes Benz, Minerva, Pabst, Packard, Ralph, Stoop, Vignale, Wilson, Zagato on October 16, 2013 by Ralph.